Where did Francis’ journey to Christ begin? It began with the gaze of the crucified Jesus. With letting Jesus look at us at the very moment that he gives his life for us and draws us to himself. If I read only those three lines from Pope Francis’ homily for the feast of St. Francis of Assisi, I would have enough to contemplate for the next year. Or more. On the memorial of this saint who is loved world wide, the Holy Father visited Assisi, where he met with 100 or so sick and severely disabled children at the Seraphic Institute, blessing each and kissing the cheeks of many of them. He then went to the Archbishop of Assisi’s residence, visiting the famous room in which St. Francis stripped off his clothes and gave them back to his father in order to begin a life of poverty dedicated to Christ more than 800 years ago. Finally, he said Mass in St. Francis Square, attended by thousands. All of his words that day were powerful – at the Seraphic Institute and the Archbishop’s residence (where he debunked the secular media-generated notion that he intends to divest the bishops, cardinals, and himself), and in his Mass homily. In each address, he put aside his prepared text and spoke directly from his heart. His homily, however, really touched me, especially the lines with which I opened this post. 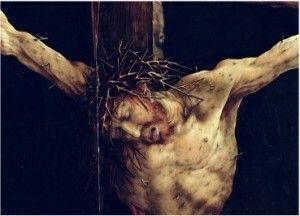 I have countless times sat before the Crucifix, meditating upon our Lord’s suffering. I’ve thought about the Blood and Water pouring from his side, and the wounds from which flowed the salvation of us all. I’ve looked at his thorn-crowned head. I’ve looked at the heavy, cumbersome cross. I’ve looked at the nails binding him to the wood. I’ve looked at the gash in his side and the holes driven into his hands and feet. I’ve looked at the muscles straining against the deadly pull of gravity and exhaustion. I’ve looked at his face, lashed and spit upon. I’ve looked, and looked, and looked. The next time I sit before the crucifix will be very different for me. I won’t be thinking about looking at Jesus, but rather I’ll be thinking about trying to put aside my self-consciousness and allowing him to look at me. It’s one thing to look at our crucified Lord and acknowledge my sinfulness. It’s like stepping on the scale after a holiday binge. Only you see how your weight has jumped. It’s another thing to allow our crucified Lord to look back at me. He’ll not only see my weight, he’ll see everything about me including all of the sins I’ve ever committed or ever will commit. He’ll see my joy and creativity, but he also will see deep, deep into the dark part of me that causes me to hurt others and fall short of my striving to imitate him. He’ll see the part I don’t want to admit that I have. And what will I see in his eyes? I will see love, the love of God incarnate, a love which does not die, but triumphs over evil and death. How can I – or anyone else – fear that?